I recently read an article about flying with children that was hysterical. Written by a man, it was a fantastic and self-deprecating look at just how painful it is to make the trip to grandmother’s house in the woods via airplane. And as we all know, the pain isn’t centralized to the family traveling, which got me thinking. With less than a year under my belt as a flight attendant, I often get asked by friends, family and acquaintances about my pet peeves or other ridiculous things that I see or that have happened while working at 35,000 feet. Sadly, a lot of them involve children or parents or a combination thereof. Here are some observations from the top, and some things to keep in mind the next time you board a plane with your children. Changing Diapers on the Seats or Tray Tables: You do realize, that seat is not your personal throne that you’ll take with you when you deplane. And contrary to popular believe, people do eat the snacks we hand them…wait for it…on the tray table! So for those people who change their child’s diaper there, here’s my question to you. Would you do that on your Crate and Barrel leather couch or your slab-granite countertops? No, you wouldn’t, so have the same respect for my “home” at 35,000 feet. And if you don’t want to, potty-train your kid earlier and take Amtrak where the waste falls by the wayside through the horror hole beneath the train. Milk-less Mothers: Recently, I had a mom come to the back during boarding and ask me for milk. I gently explained to her that the milk we have is not refrigerated and it’s not something I would drink myself, but she was welcome to it if she wanted a carton. As she rolled her eyes at me, she asked for a pair of scissors to cut open the carton so she could pour it into the baby bottle she was holding. I don’t have scissors; they’re not allowed through security. She proceeds to ask me for another carton, and since I knew she was sitting in the front of the plane, I suggested she ask the flight attendant in the front galley. I could see the milk being sloshed up and down the aisle as she hurried back to her brood, and I didn’t want to smell that for three hours. As she’s headed back to her seat, she turns around to tell me she’s flying alone…with three children…as if this is going to elicit some sort of sympathetic response from me. Dear barker: wrong tree. First off, I wonder why you’re alone with that abrasive attitude, and secondly, our galleys aren’t a 7-11. They sell milk in the airport, and if you were a real “wondermom” like you claim, you would’ve packed your own, as that IS something they will let you bring through security. Not Listening to Announcements: Okay, so this is a great time to remind everyone that flight attendants aren’t your personal butlers in the sky. We’re there for your safety, and that little window in front of our jumpseats isn’t a two-way mirror. We can see you rolling your eyes during announcements, pretending to sleep, etc… But I digress. On a recent flight after we landed, I had a mom who didn’t think my announcement applied to her. It’s pretty much common knowledge that you don’t get out of your seat while the airplane is taxiing, which we were. She got up and opened the overhead bin to retrieve a rollaboard suitcase. No, not a soft-sided duffelbag or a small purse. A rolling suitcase that she could’ve easily dropped on the people sitting below. Of course, I repeated my announcement that we were on an active taxiway, so she took the suitcase to her seat. During deplaning, the captain asked me if the woman coming up the aisle was the one who got up during taxiing. I said yes. He stopped her and asked her why she ignored our announcements, to which she replied in a snarky tone, “I had to get something for my son.” What she really got was a stern lecture from the captain who heard me tell her to sit down and watched the whole thing on camera from the cockpit (yes they have those). Hot Laps in the Aisle: I get it…kids need to get up and move, but for the parents that let their kids do hot laps in the aisle from seat-belt-sign-off to seat-belt-sign-on, here’s some food for thought. This is when we do become temporary servers, and when we’re trying to serve drinks–scorching hot ones, full cans of baby-crushing Coke, etc…–we really don’t need two-foot tall speed-bumps slowing us down. Lets do a math problem: you’re two-feet tall, I have a tray of drinks in my hand and my face in an order tablet to see where I’m taking them, and we crash together ceremoniously in the aisle. Who wins? Speaking of the Aisle: While this isn’t a personal story, it did happen to a friend of mine and is worth sharing to reiterate the importance of safety on board an aircraft and staying in your seats when we tell you to. Oh, and I’m most definitely talking to you, mom in the story above, who couldn’t wait to get her kid’s Teletubby out of the suitcase. It’s the same set-up: the plane is taxiing, only this time, a mother is letting her small child play in the aisle. My friend makes the announcement that everyone must be seated with their seatbelts securely fastened until we are parked at the gate. Crickets. So, they make a second announcement. Crickets. The kid continues to play in the aisle. Which prompts a third more specific announcement: “To the mother of the child in the pink shirt, please keep her on your lap until we are parked at the gate.” Not two minutes later, a plane pulls out in front of their aircraft, forcing the pilot to slam on the brakes. Said child in the pink shirt ends up face-down near row 1 (they were sitting in about row 9), teeth knocked out, mouth bleeding, and she got to deplane on a stretcher. This isn’t 3:47 minutes of free babysitting. Watch your kids or watch what happens. 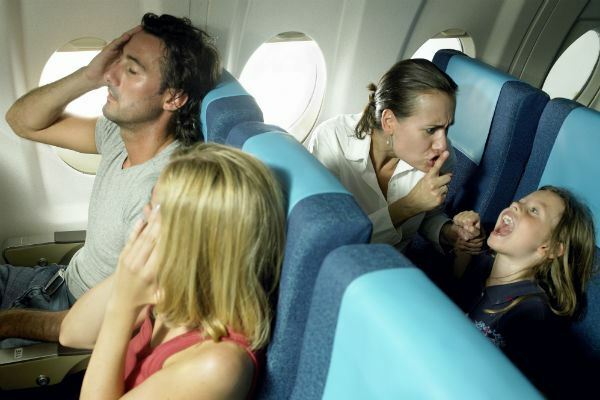 Posted in Airlines, Random Ramblings, Travel and tagged aviation, pet peeves, transportation. Bookmark the permalink. That’s my girl, love you! It “needed” to be said . Bravo and merci Kyle !! !